Open an existing or record a new file. Tap on Import / Mix and in the menu on “Mixes the current file with another file”. Choose a file and tap on Open. 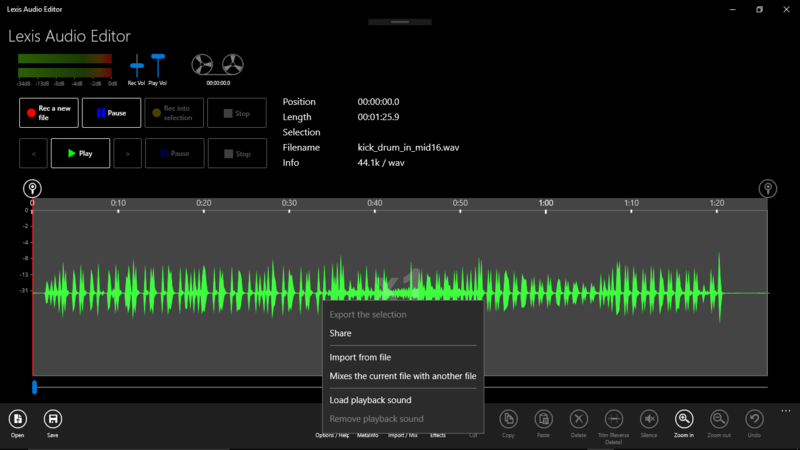 In the dialog “Mix files” you can set the audio level of the current file and the imported file. 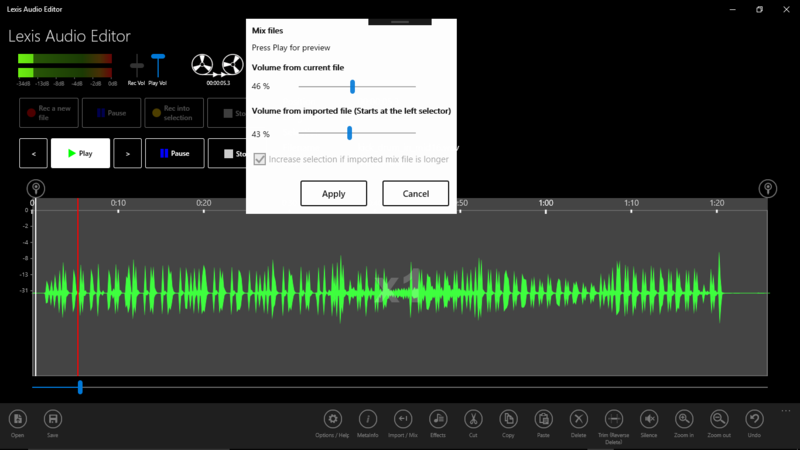 If the checkbox “Increase the selection if imported mix file is longer” is checked, the result duration will increase at the end, if the imported file is longer than the end if the current file. Set the desired start position with the start selector . It is the startpoint to mix in the second file. 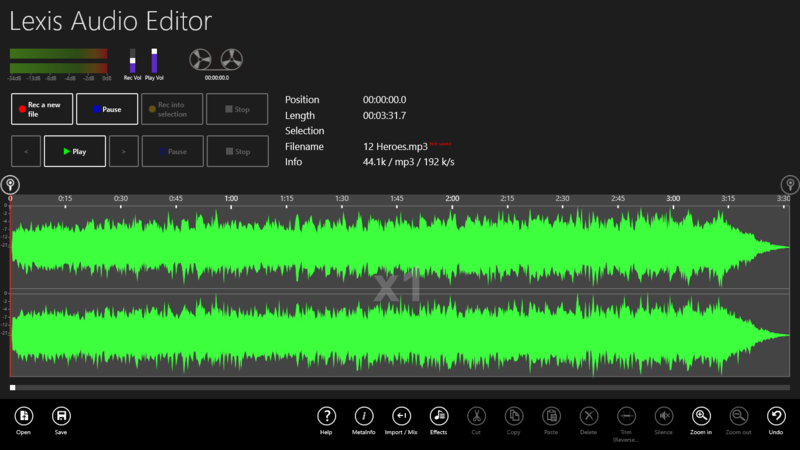 Click on Play for preview to verify the startposition and the mix volumes of the two files. 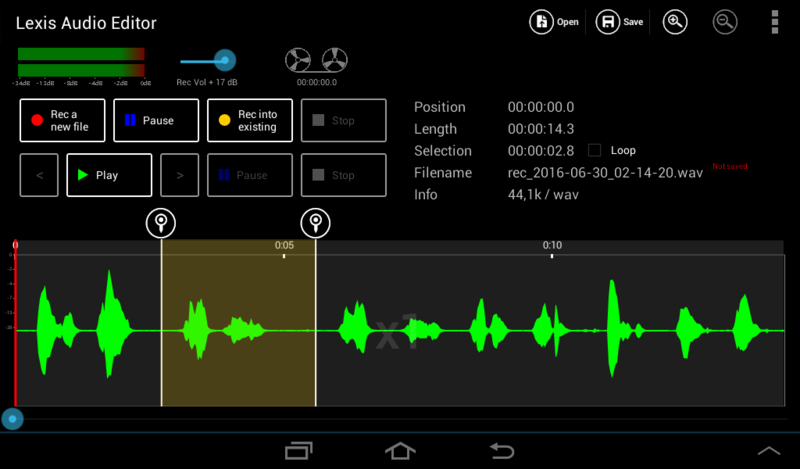 Tap on “Apply” to mix the two files. You can see the mixed result between the start and end selector. Select a start position or a range with a start and end position. At this position or range the new record will insert. 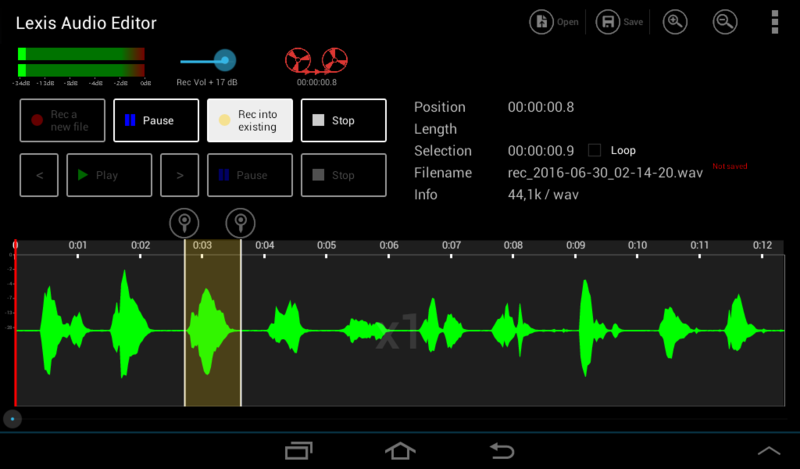 Tap on Rec into selection and record your audio sound. 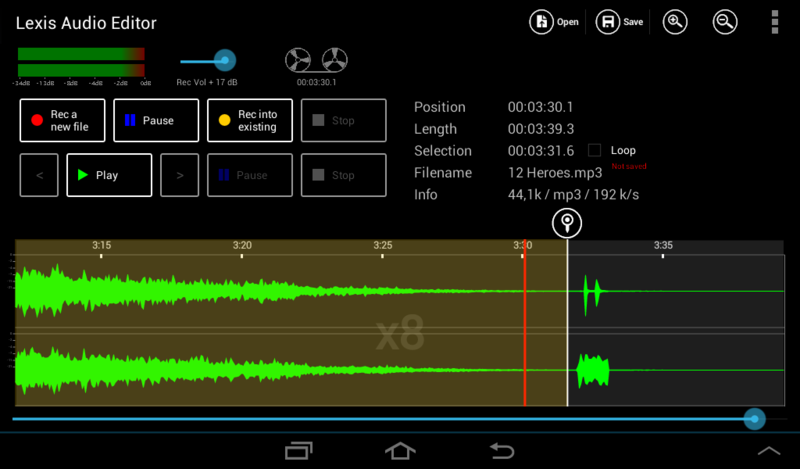 The recorded audio sound will insert in your defined range and the old sound will overwritten. Tap on Import / Mix and in the menu on “Import from file”. Choose the sound file you want to append at the end of the actual file. 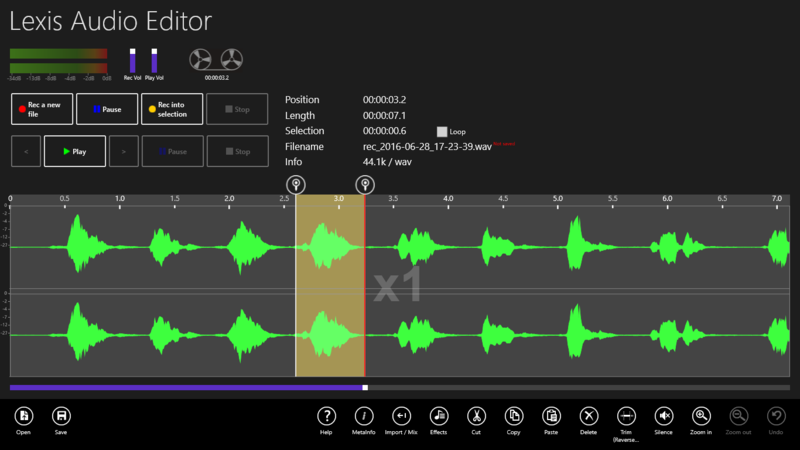 If no start selector is defined, the sound file will append at the end. Tap on “Open” and the file will import. 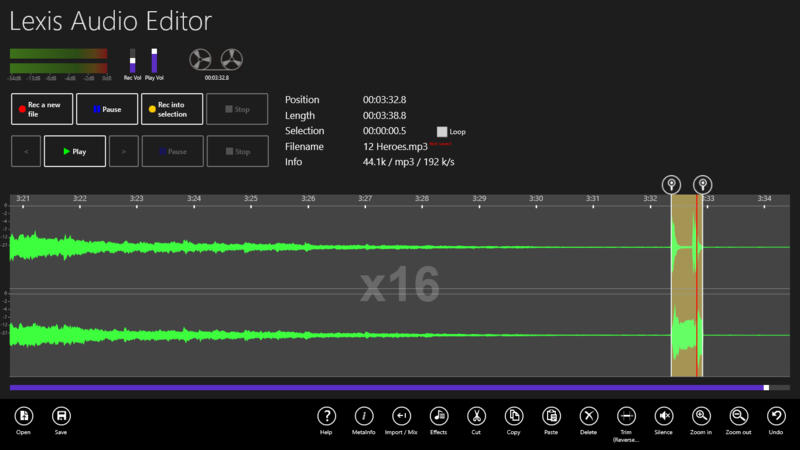 If you want to append the sound file not at the end of the record, you can define a start selector. 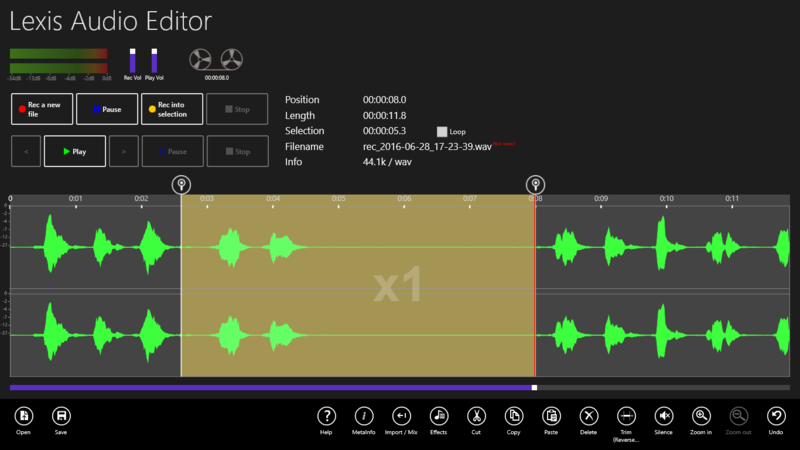 Move the start selector to the desired position and tap under Import / Mix on “Import from file”. The sound file will insert at the selector position. Also you can replace a range between the start and end selector. First define the start position. Move the start selector to the desired position. 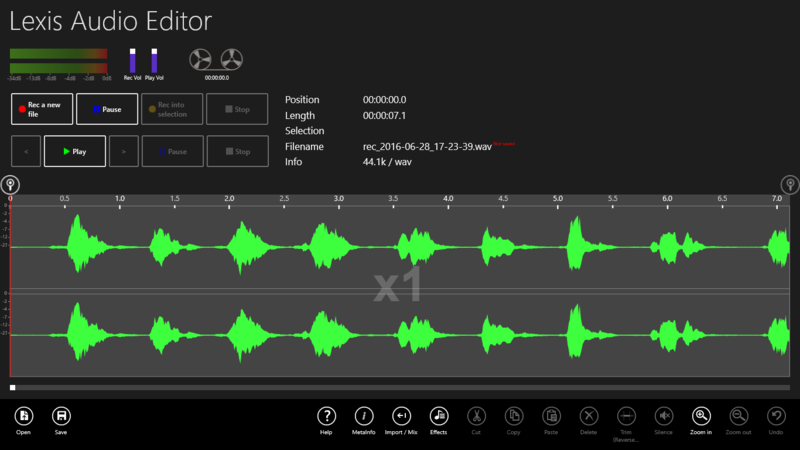 If you want to set the start position exact to the sound file start, tap two seconds on the start selector and tap in the context menu on “Set to startposition”. Move the end selector to the desired end position. To adjust the end of the selection more accurate, double tap before the end of the selection in the orange area to play the last part. 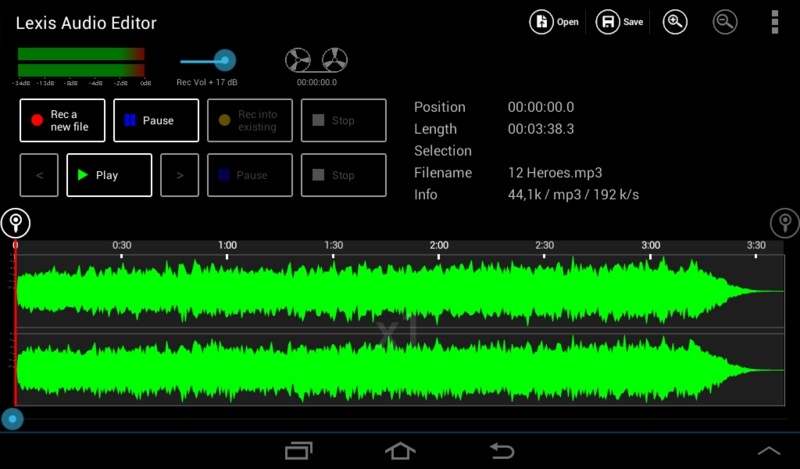 Now you can Zoom in and move the end selector more precise. Tap on Trim to remove the area outside the selection. Tap on Copy to copy the selection to the clipbard. In the destination file move the selector to the position you want to insert the clipboard. Tap on Paste to insert the clipboard at the position of the start selector . If you have defined a range (Start and end selector are defined) the range will replaced with the clipboard. Open the main menu with a click on the right above corner on the button with three points. Some functions are only available if a selection has been defined. To set the startposition, shift the left selector (round button upstairs of the curves at the left side of the screen) to the desired position. To set a range, shift the left and right selector to the desired positions and click on the menu the desired function. Shift the left selector full to the left side to remove the range. Shift the right selector full to the right side and the startposition will remain. To set the left selector exact to the beginning, press and hold the left selector 2 seconds, then select “Set to startposition”. The same concept applies to the end position. 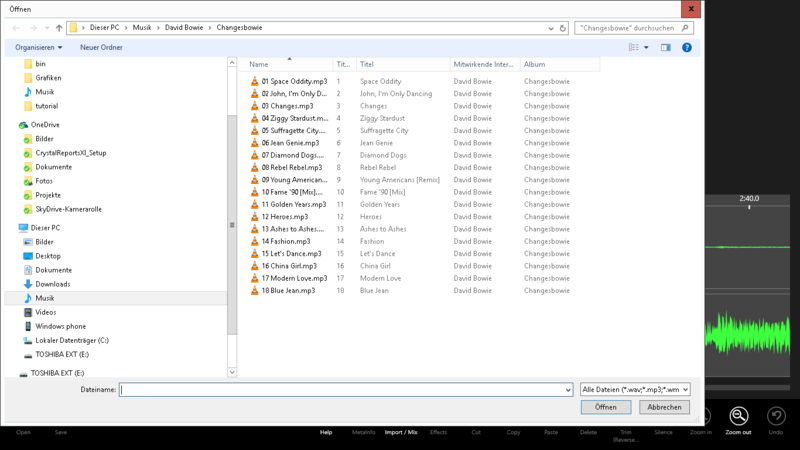 To select the entire audio file choose “Select all”. Click on “Open”, choose a file and click on “open”. If the current file is not saved a warning messagebox appears. Click on “Save” and write in the filepicker dialog a filename. 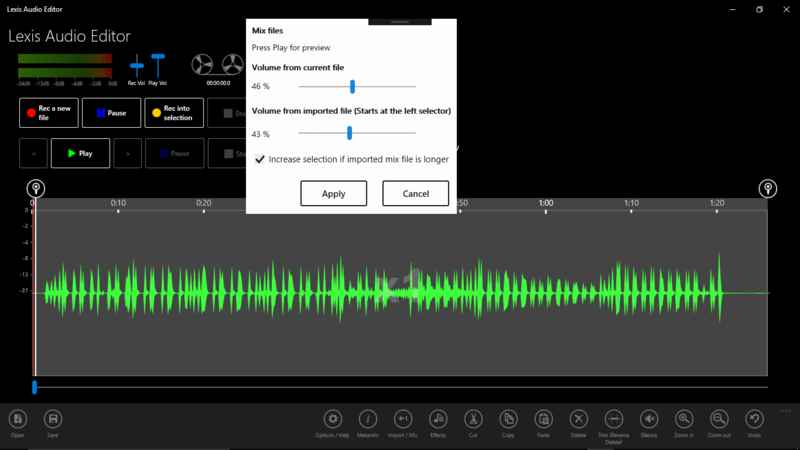 Choose the desired format “mp3”, “m4a”, “wma” or “wav”. If the current file is in the wav format, the compressed file types use the quality defined in the options. You can change the bitrate of an open compressed file with a click on the textfield “Info”. The new bitrate will apply if you save the file. Click on “Zoom in” or “Zoom out” to enlarge the time window until 128 times. Shift the Play-position or the time window with the slider parallel to the screen bottom line. 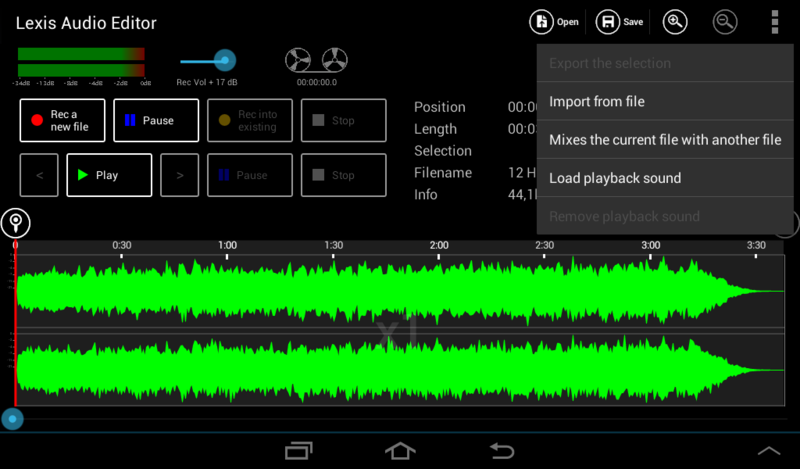 Play the current audio file with a click on “Play”. Click on the buttons “<” or “>” for a two seconds step forward or backward. If you click on one of this buttons longer, the steps will repeated. With a click on “Pause” you can break the playing and you can continue it with a click on “Play”. 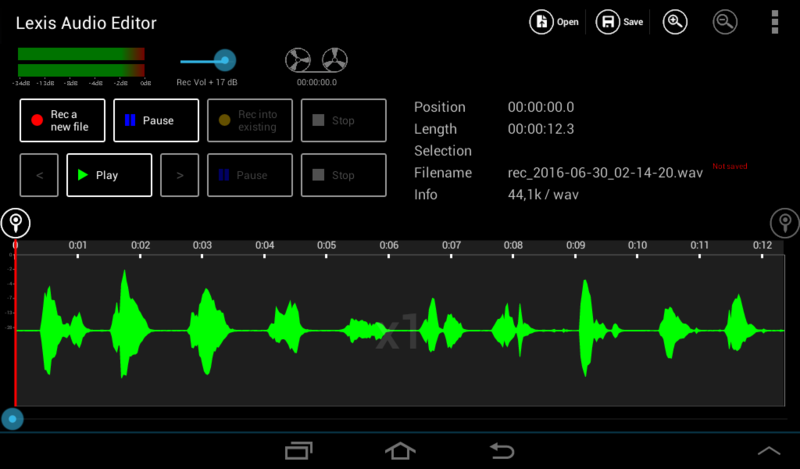 To start the audio file at any point, double tap to the appropriate location in the curve area. Click on the Button “Rec a new file” to start a new record. If you want to observe the record volume first, click on “Pause” and then on “Rec a new file”. If the current file is not saved a warning messagebox appears. 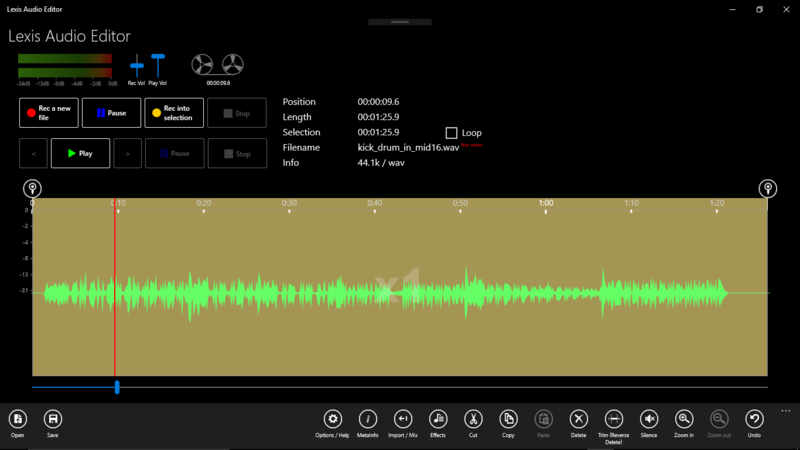 If you want to insert a record into a existing audio file, first slide the left selector (upstairs of the curves) to the desired position. Klick on “Rec into selection” or an “Pause” and then on “Rec into selection”. You can also overwrite a range within the left and the right selector. For Cut and Copy a selection is required. You can copy a selection from one file to another file. If no selection is set, some effects will apply for the whole file. – Fade in/Fade out: Fade in/out the defined selection. If only the startselector is defined, the fade in/out applies from start of the file up to the selector position or from the selector position to the end of the file. – Noise reduction: Suppresses noise under the defined level and suppresses higher frequency noise with the low pass filter. – Compressor: Compresses the record. Increase the loudness of the record to a uniform level. 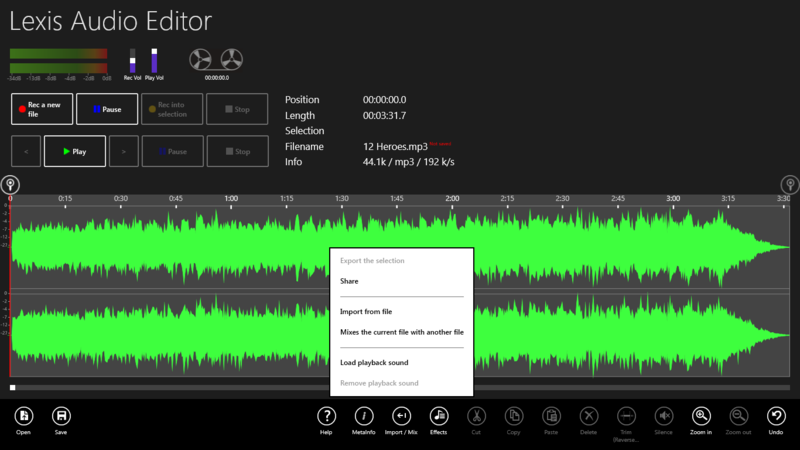 – Equalizer / Amplifier: Corrects the frequency spectrum of the record. Uncheck the checkbox “EQ” if you want to use only the amplifier function. – Normalize: Amplifies the record to the maximal level who is possible. 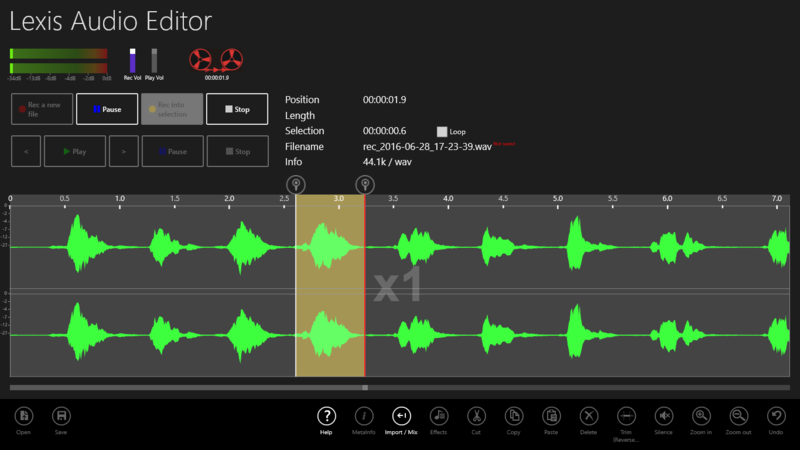 – Change speed: Change pitch and tempo. 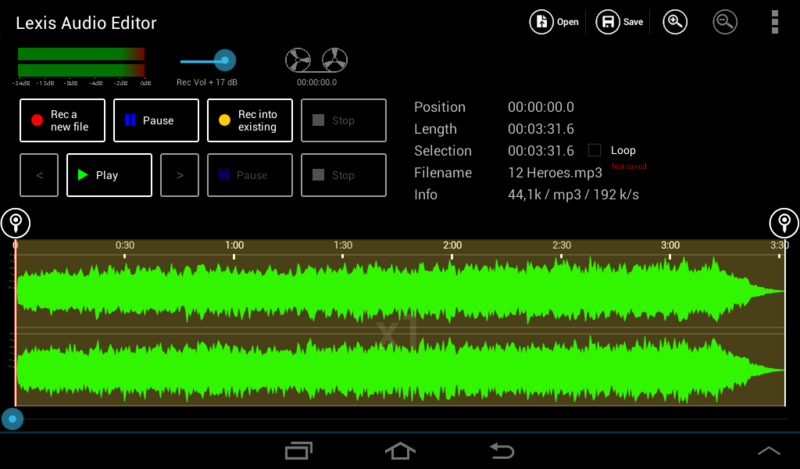 This corresponds to play a recording faster or slower. – Vocoder: Splits the signal into frequency bands and composes a new signal of sine or filtered noise, corresponding to the amplitudes of the frequency bands. – Echo: Select the “Echo level” and the “Delay” to define the strength and delay of the echo relative to the original signal. With “Feedback” you can define the strength with which the feedback signal is attenuated. Click on “Import from file” to append the selected file at the end of the current audio file. If a selection is defined the file will insert at the position of this selection. 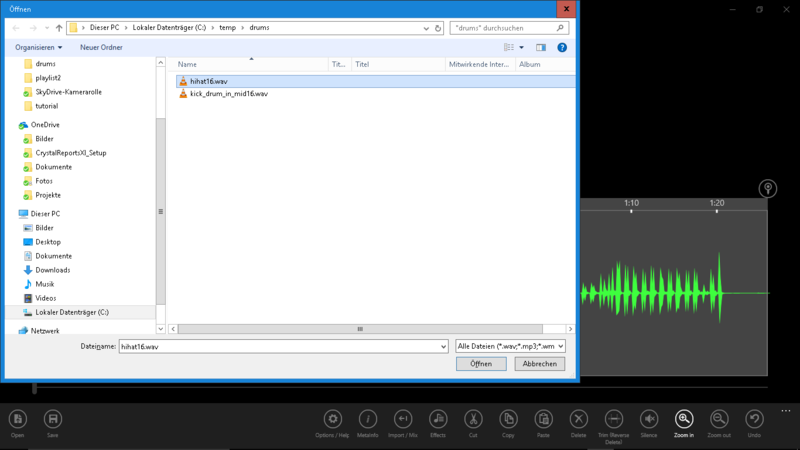 Click on “Mix the current file with another file” to mix the selected audio file into the current file. 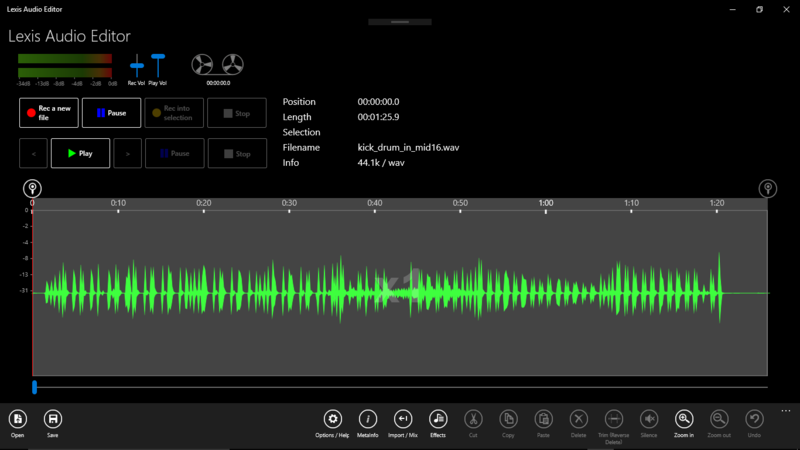 In the Dialog “Mix files” you can define the recording levels of the two audio files that are mixed together. Select the check box “Increase selection if imported mix file is longer” in order to achieve that the duration of the newly selected file to be mixed is fully present in the result. The imported file will mixe in at the startposition of the selector. 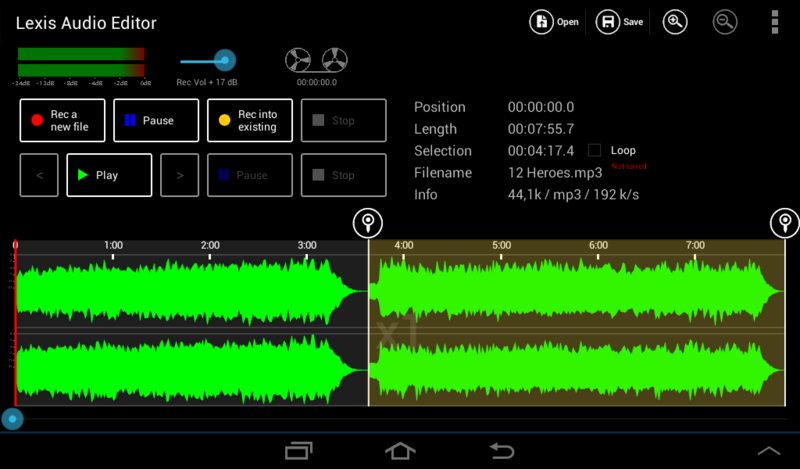 The function “Load playback sound” is mostly for musicians for multitrack recording usefull. 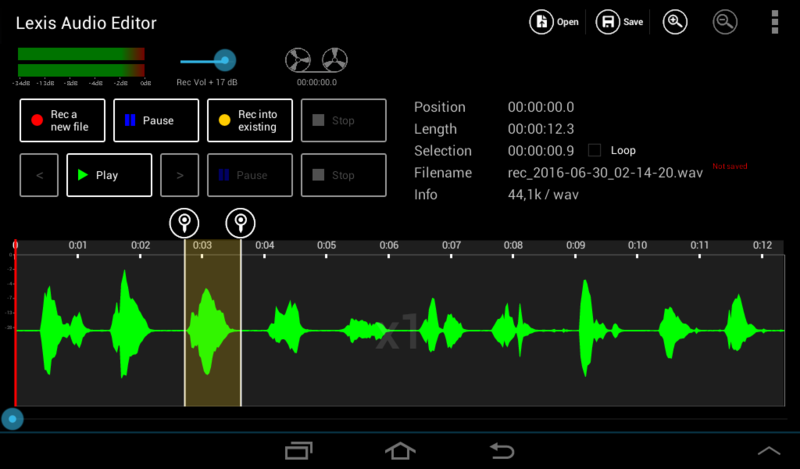 If you want to record with a playback sound, click on “Load playback sound”. 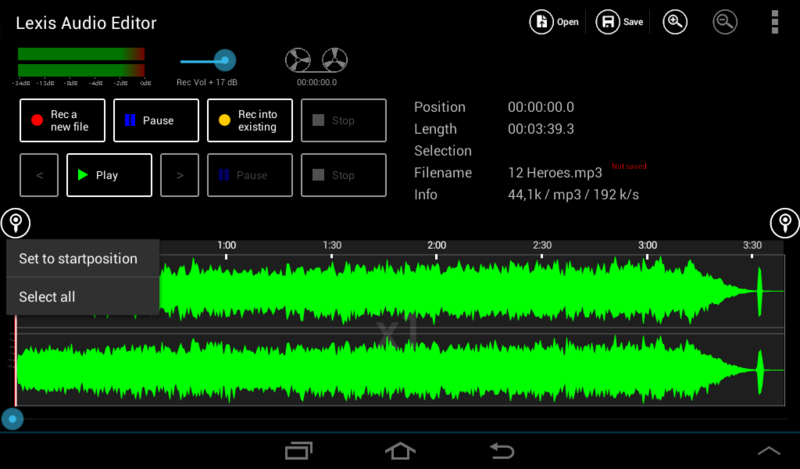 You see the present of the playback sound, if the background of the record button is green. 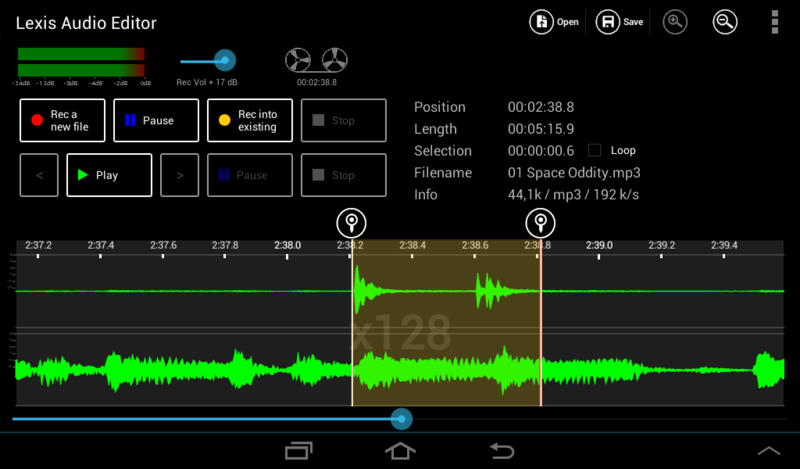 If you click on the record button, the playback sound starts and the recording begins. 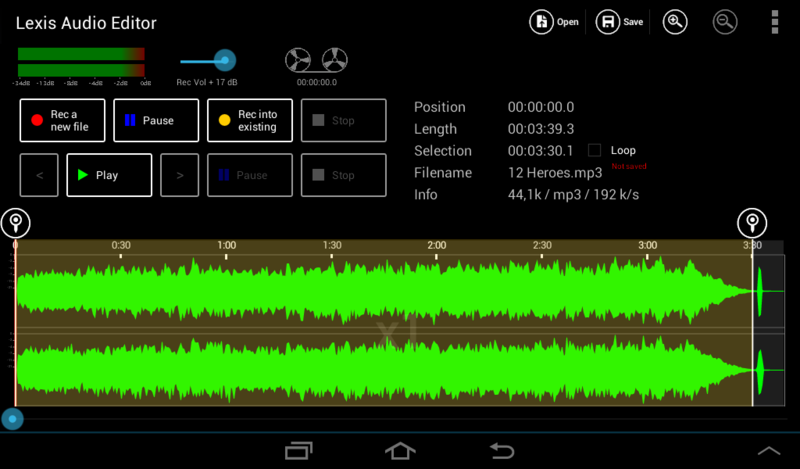 You can adjust the start of the recording in the options under Latency. 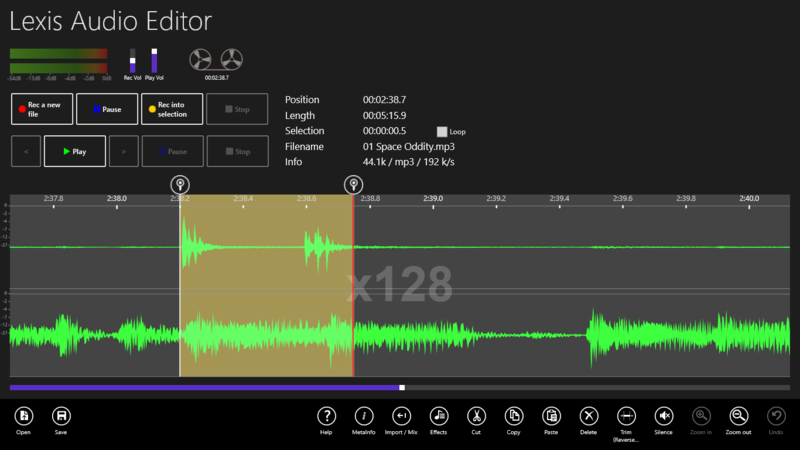 To remove the playback sound, click on “Remove playback sound”. To send a record to an other program, like a e-mail client, click on “Share” in the menu “Import/Mix”. If the actual file is in wav format, it will, before sharing, convert to a compressed audio format. You can choose this format in the options. 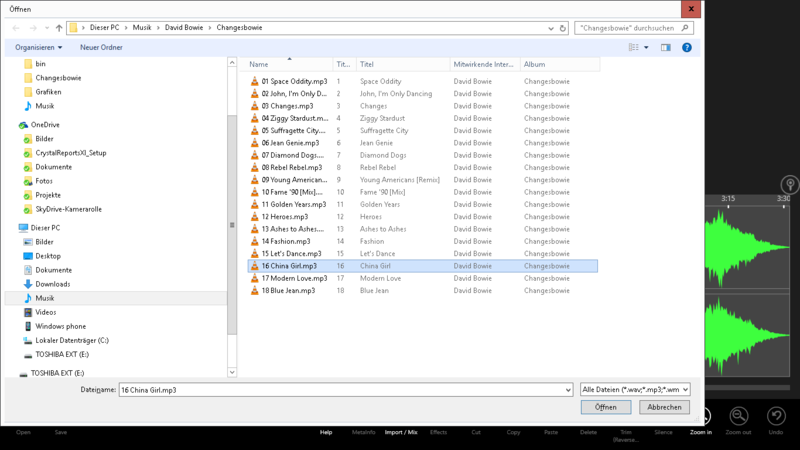 The metadata is stored in the header of the audio file and can be used to associate the artist and other properties of the file.